Time to put away the utensils and dig in with your bare fingers! 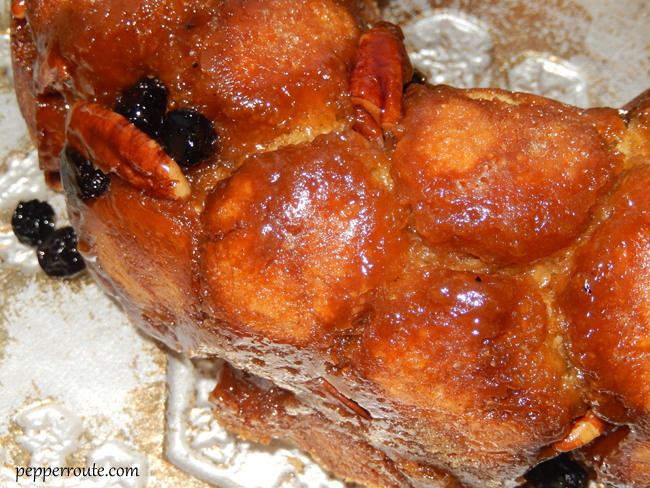 Yes, it is Monkey Bread time! 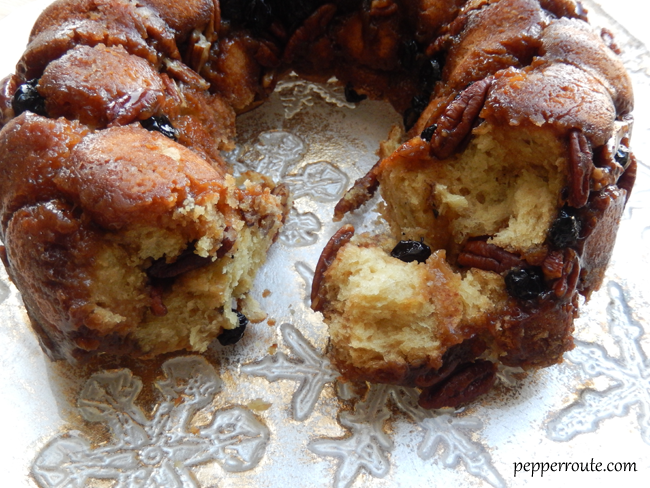 A cluster of warm, sweet, delicious pieces of bread, baked usually in a ring shape in a bundt pan… and you pull apart these pieces just like a monkey! 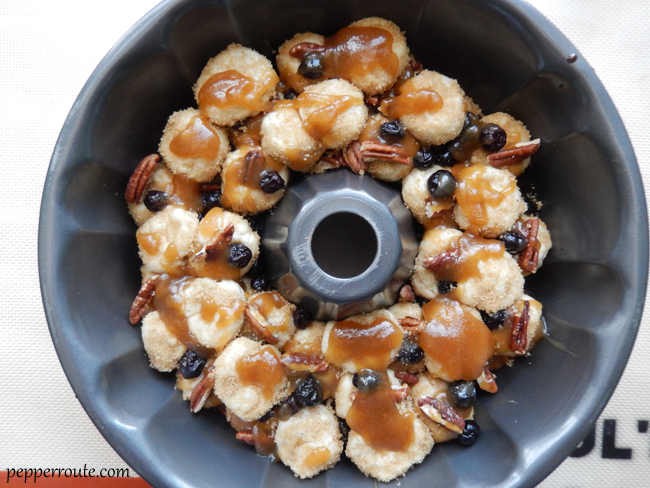 Hence the name, monkey bread. 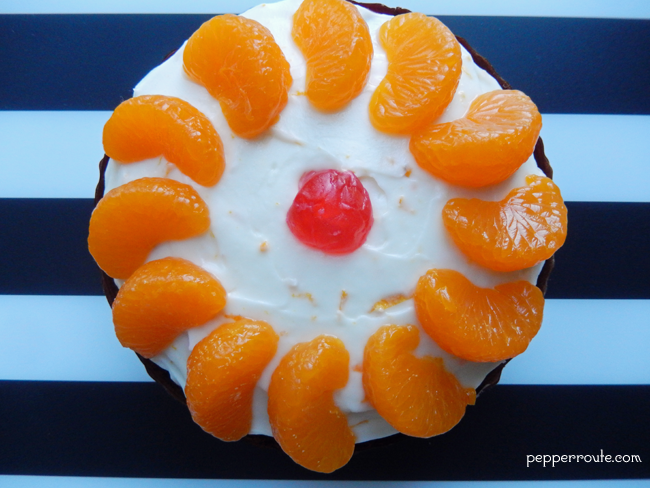 There are various theories about how it got its name… its resemblance to the fruit of the monkey puzzle tree, the monkeying around you have to do to make the dish (absolute pish-posh; it is an easy dish to make), and my favourite… one can channel one’s inner monkey while eating it! 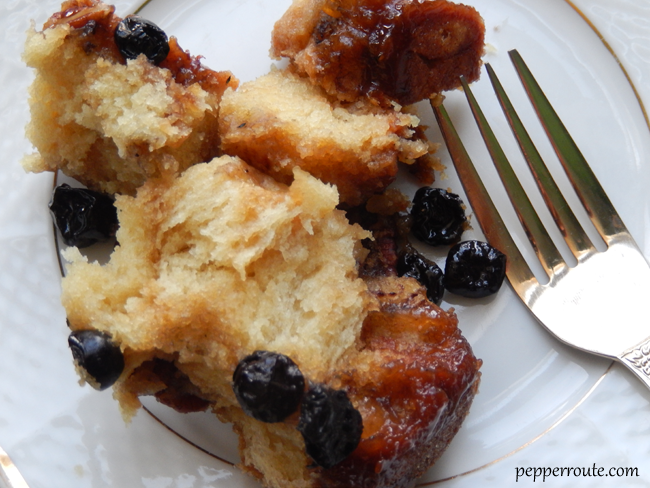 Monkey bread does not have a long tradition on the food scene, the first mention of it appearing in cookbooks and magazines in the 1950s, according to the foodtimeline. Nancy Reagan used to serve it at the white house, during the Christmas season. Many of the traditional recipes use yeast in the monkey bread dough, which in my opinion is a lot of time wasted, waiting for the yeast to act. Instead, you could use a combo of buttermilk and baking powder to get the same buoyancy. You prepare the dough, cutting in the butter and then adding the buttermilk. 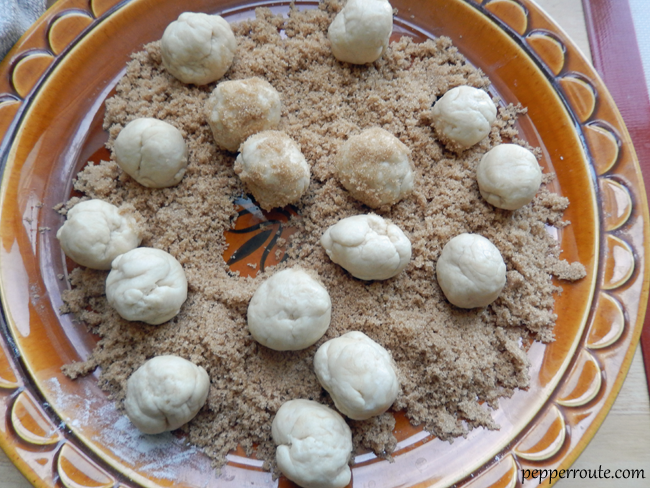 The dough is divided into small pieces and rolled in brown sugar. 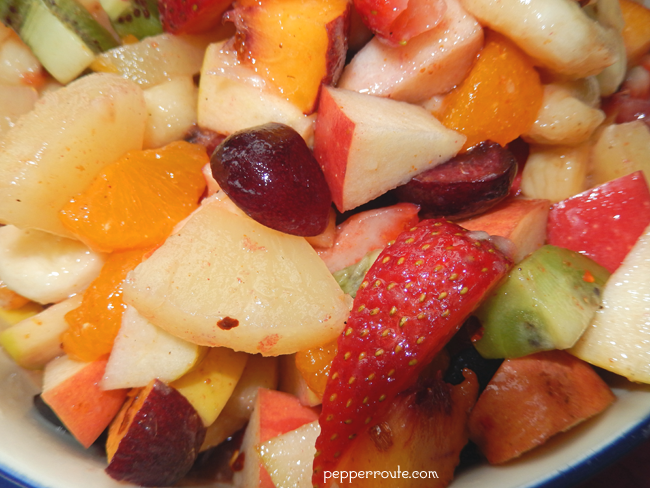 These are then layered at the bottom of the pan along with nuts and dried fruits. And if you want a really short shortcut, you could use the biscuit dough that comes in a tube instead of making your own dough. 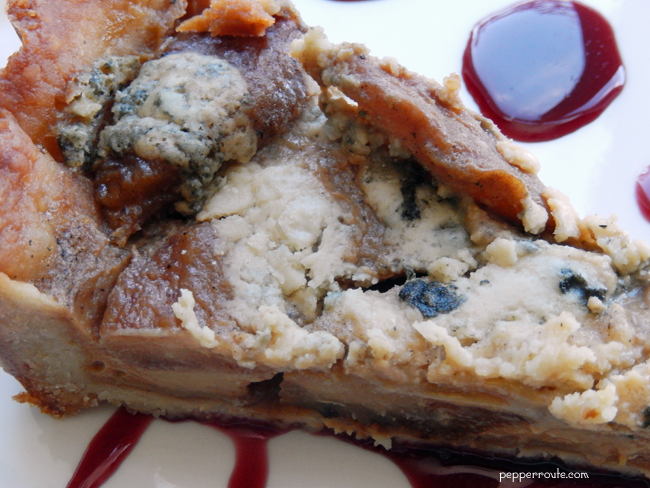 The pecans and blueberries used in the recipe can be replaced with any nuts and dry fruits. 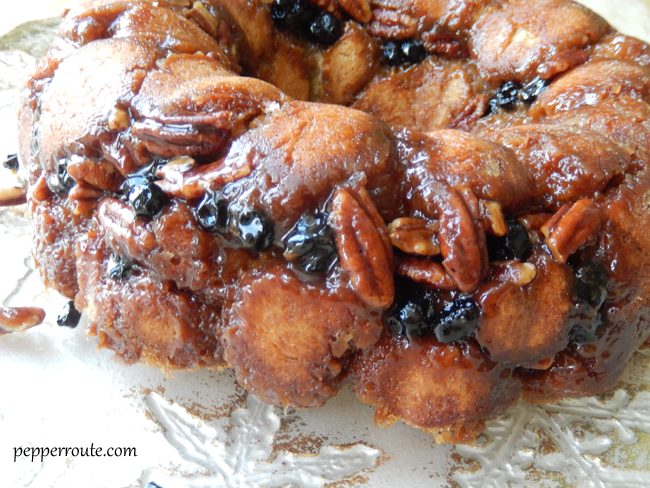 A 8 or 9 inch bundt pan works well for baking this monkey bread. Soak the blueberries in one cup of warm water for 30 minutes. Drain and keep aside. Lightly toast the pecans. Let cool and keep aside. Mix half a cup of brown sugar with the cinnamon and spread flat on a platter. Melt together 1 ½ cup brown sugar and ¾ cup butter. When fully melted, remove from heat. Pour a quarter of the butter-sugar mix into the bundt pan and swirl around to coat the bottom. Keep aside. 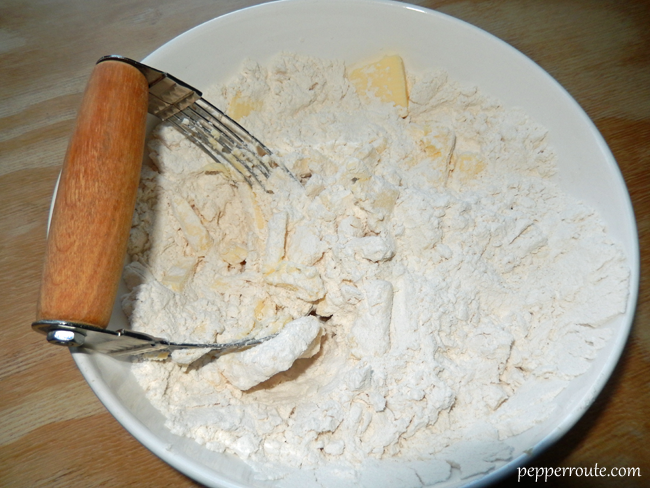 In a large bowl, mix together the flour, baking powder, baking soda, and salt. Cut in ¾ cup of butter into the flour. Add the buttermilk and mix into a smooth dough. 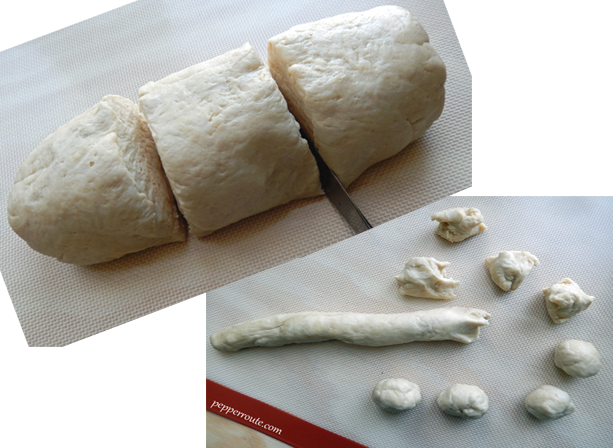 On a floured surface, roll the dough into a log and cut into three pieces. Take one of the pieces and roll it into a longish rope. Cut the rope shaped dough into uniform sized pieces, about 1 inch in diameter. 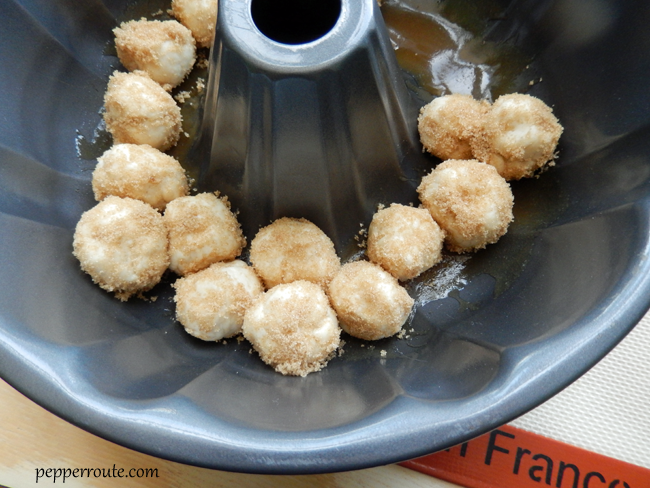 Shape each piece of dough into a rough ball and roll in the brown sugar-cinnamon mix to coat. Place the round shapes at the bottom of the bundt pan in a single layer. 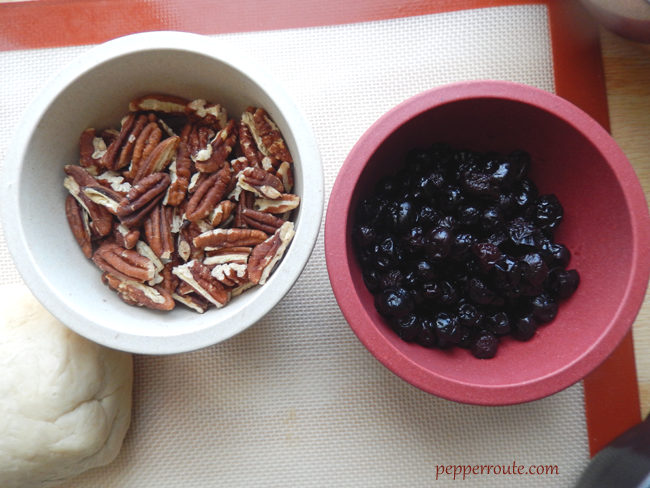 Sprinkle half the pecans and blueberries over the dough. Spoon a quarter of the butter-sugar mix evenly over the layers in the bundt pan. 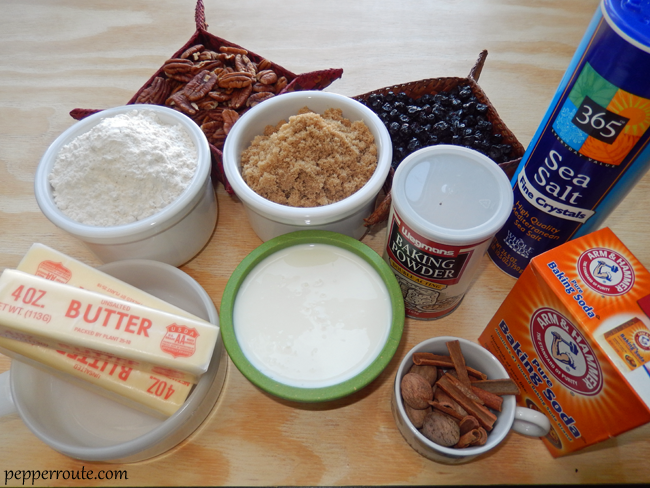 Repeat the process with the remaining two portions of dough, interspersing with layers of pecans, blueberries and butter-sugar mix. When all the dough is used up, pour the remaining butter-sugar mix on the top. 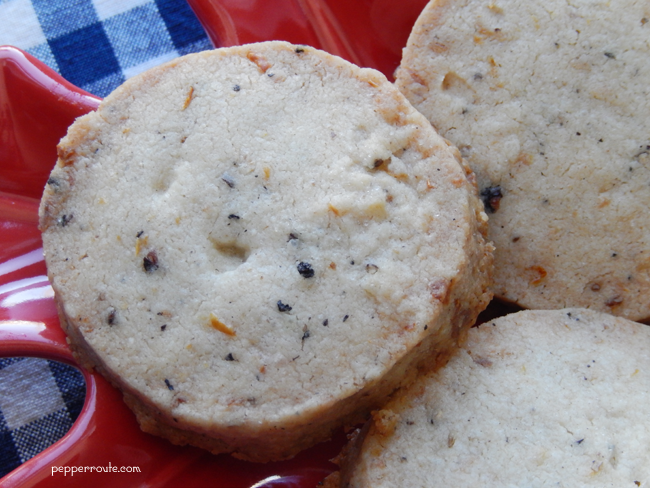 Place in the center of the oven and bake for 30 to 35 minutes. When done, remove from the oven and allow to cool for 5 minutes. Invert on to a serving platter and serve warm.